We've looked at this charming little system before, but as it's now available with the added attraction of a USB digital input (the USB-enabled amp on its own is £150), we thought we would re-live the pleasure. 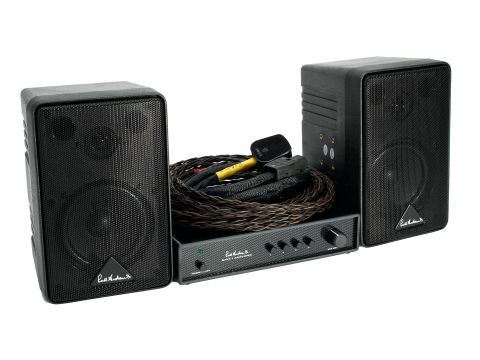 To recap, the basic system is based on a small, modestly-powered amp with three line-level inputs, which feeds a pair of similarly diminutive two-way speakers. The very 'Russ Andrews' part of the deal is the cables provided when you buy the full bundle - Kimber speaker wire and Yello mains cable. Adding a USB input is not unheard of, but it's still a pretty rare feature. The idea, of course, is to offer computer-based listeners a high-quality alternative to the analogue output of their PC or Mac, which is likely to be sub-optimal at best. USB is the ideal interface because it doesn't mind 'hot plugging', it configures itself in moments and carries uncompressed audio data. Our system worked to the script straight off, though we found it's worth keeping an eye on the computer's settings as our test PC tended to default to a low volume. One particular USB socket also produced a slight background whistle from the amp.